This year’s International Women’s Day breakfast saw over 1,000 men, women and students participate in another inspirational event. The theme was “Let’s Work Together—Celebrating Difference” and the panellists Dr Emma Burrows, Rob Hulls, Fiona Patten, Josh Bornstein and Kristen Hilton explored this under the moderation of Walkley Award winning journalist Catherine Fox. MC Josh Earl had the audience in fits of laughter. 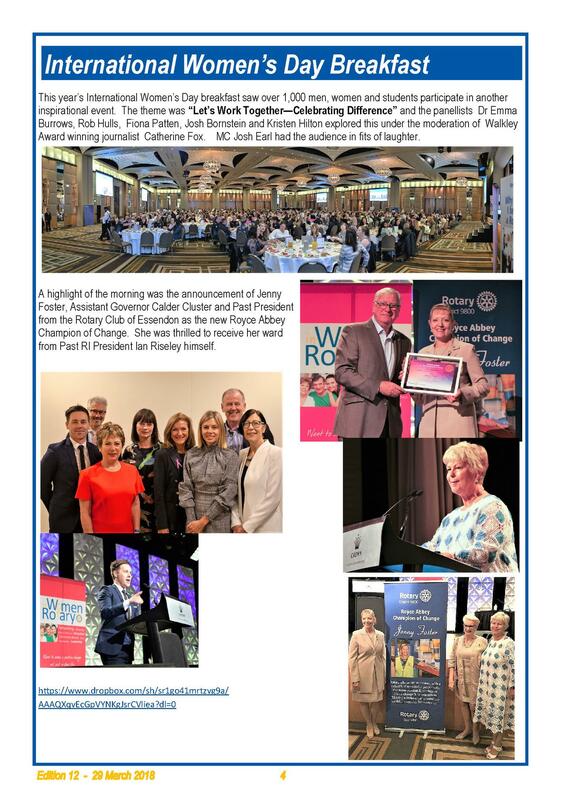 A highlight of the morning was the announcement of Jenny Foster, Assistant Governor Calder Cluster and Past President from the Rotary Club of Essendon as the new Royce Abbey Champion of Change. She was thrilled to receive her ward from Past RI President Ian Riseley himself.